Of the materials listed above, any one of which is suitable for making drawers, Berkeley cambric and longcloth commend themselves for greater strength and durability than nainsook or crepe. Nainsook, however, is delightfully comfortable, light in weight and easily laundered, while cotton crepe is finding larger recognition, because it not only washes easily, but can be worn without ironing, a saving of time and labor. 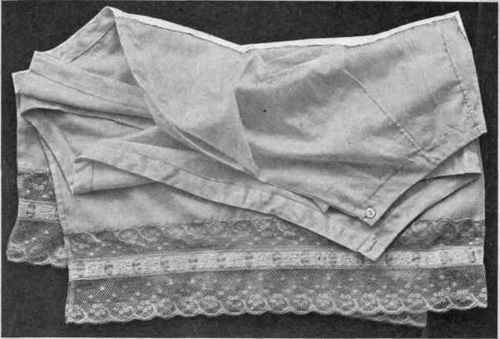 A wide range of trimmings is to be found in the various laces, edgings, and even in the materials themselves. It remains only for the designer to make her own choice of fabric and decoration. The type and cut of the drawers may be left to individual choice; either closed or open drawers may be cut on straight or circular lines. These are cut so that the lower edges are straight, and the fulness at the waist is taken out in darts. In 282 closed drawers, a dart is sometimes taken out in the placket by folding off some material on each side of the opening. Circular drawers have curved lower edges and are cut circular at the top so that all fulness is removed at the waist line. They are very comfortable to wear, because of lack of fulness at the top, yet permitting freedom of movement. If the drawers are to be of a set of garments, the decoration should be in keeping with that of the remainder of the set. There is, however, no reason why the body of the drawers should not be made of one material, cambric or longcloth, with ruffles of another, nainsook or fine lawn. Nainsook is preferable for this because of its softness. Fig. 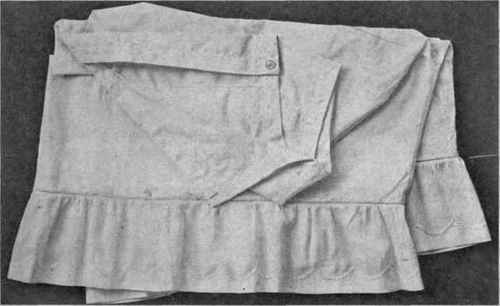 16.6 shows simple use of the material for a ruffle, this having a hem shaped at the top which is edged with feather-stitching, and set into the drawers with entre-deux. The ruffle adds little expense to the garment, the embroidery cotton a trifle, the entre-deux more perhaps, and there is time to be expended on the featherstitching; how much, depends on the speed of the worker. In Fig. 167 is shown a more elaborate decoration, using lace and' embroidered beading through which dainty colored ribbon is run. This garment is one of a set, the night-gown and skirt being shown in other illustrations. The material is all of good quality. The lace, which is a very attractive pattern, of durable quality German Valenciennes, is set in by hand. Just here is illustrated what one needs to consider in planning undergarments of an elaborate type. Much as we desire them, before the work is undertaken, the amount of time and labor involved must be considered. If both can be afforded, then well and good. For frequent wear, however, the simpler decoration is to be commended, and with woman's wider participation in business and professional life simplicity in garments is being increasingly stressed. Suggestions for other types of trimmings which may be applied either as ruffles, or to plain edges, are shown in Fig. 168. Fig. 166. 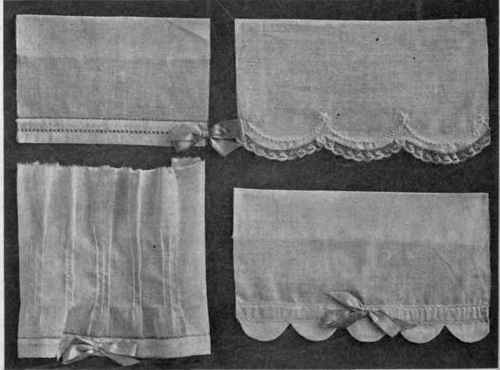 - Drawers of nainsook; simple use of material for decoration; hem on ruffle shaped at top edge and featherstitched. Fig. 167. - Drawers of nainsook with lace and embroidered beading used for decoration; part of a set of undergarments. FIG. 168. - Suggestions for decoration suitable for lower edges of drawers.